One of the questions I have about Patrick Parker and Mary Murphy is when they emigrated from Canada to the United States. Their family appears in the Canadian census in Blanshard township, Perth county, Canada West on 11 Jan 1852. The next recorded place I have for them is in Glen Haven township, Grant county, Wisconsin on 1 Jun 1860. I can narrow the time of emigration by looking at his son James Parker. James requested his first papers in January 1859 in the Grant County District Court. James married Ellen Neagle in Jun 1857 in Middlesex county, Canada West, just across the county line from Blanshard township. James has two sons in the 1860 US Census, John Patrick and Napolean. John Patrick’s birth was likely in July 1858 in Wisconsin. If correct, James emigrated to the United States between Jun 1857 and Jul 1858. More likely than not, Patrick emigrated with his son. One record series I thought might confirm that is the series at the Family History Library, Blanshard township property tax assessment rolls, 1851-1899, specifically the film covering 1851 to 1866. I ordered it back in December, but a new job and other life issues kept me from reviewing it until this past week. Luckily, I remembered to renew the rental before it expired in February. This is what I found. In 1851, Patrick Parker appears paying taxes on lot 16 in concession 9. This is the same lot and concession where he was recorded in the 1848 Canadian Census. 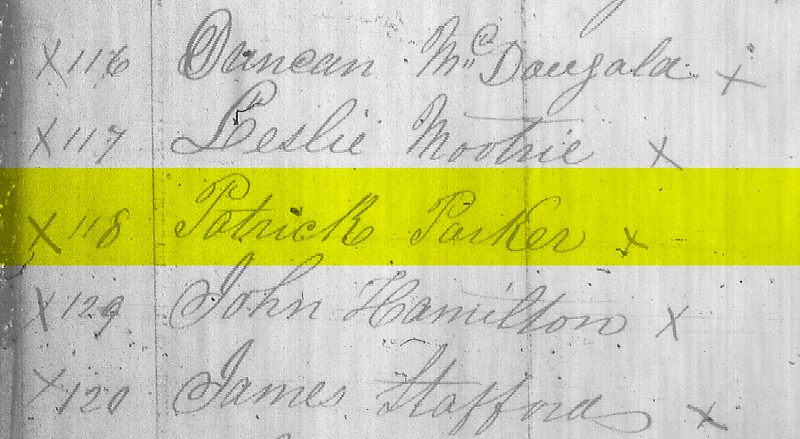 In 1858, Patrick Parker is not to be found on the tax roll. Instead, a James McDonald owns lot 16 on concession 9. And the roll for 1857 has the name J. McDonald to the right of Patrick Parker in a column headed, Owner . I believe this means the land had been sold to James McDonald prior to the time of the assessment, or possibly it was a notation put in after the fact when James McDonald did purchase it. This narrows the sale of the property to late 1856 or 1857. The tax rolls appear to be filed in the spring of each year. The sale of his property matches the dates of emigration for his son James, making it even more likely he emigrated about the same time. The next place to look is to see if any records show him purchasing land in Grant county Wisconsin about that time.